This week’s Daily Updates have had a heavy international focus, especially on China but also India. This particular update is from this morning and seeks to understand why Apple fares so differently in these two critical markets. To read all of the Daily Updates for $10/month or $100/year, please visit the membership page. Apple Inc., which has struggled in emerging markets because of the price of its new iPhones, has devised a strategy for India that’s starting to pay off: It’s pushing older models that offer cachet at affordable prices. The iPhone 4, which was released in the U.S. in June 2010, is still available. So is the iPhone 4s that went on sale in October 2011. Apple’s approach in India has helped it build traction in a country where 225 million smartphones will be sold this year, said Brad Rees, chief executive officer of London-based Mediacells, a marketing company. Apple, the fifth-largest vendor in India, more than doubled sales there in the first quarter to 325,000 iPhones from a year earlier, according to researcher Canalys. I’m honestly a little hesitant to jump on this article; it fits a little too neatly into the prevailing narrative about iPhones. Moreover, according to the numbers in the article, the iPhone is on pace to have less than one percent of India’s smartphone market, so the iPhone is not exactly dominating. It’s not so much that the iPhone has saturated the American-style and European-style markets, and ought to focus on the Asian-style one; rather, the iPhone has saturated the high end in all three markets – the high end just varies in accessibility ($200 for American-style, $650 for Asian-style). And, if you accept that the iPhone is in roughly the same competitive position in all three markets – that the difference in market share is due to inherent structure of the market – then it’s not at all obvious Apple should focus on the SE Asia-style market. In fact, it’s obvious they shouldn’t. It’s not that the iPhone has fully penetrated developed countries, leaving the rest – we’re not talking about a Pampers or Pepsi here, or some other consumer packaged good. Rather, the iPhone is an affordable luxury item; the percentage of the population to which it is affordable just happens to differ market-by-market. The iPhone targets the high-end in all markets, not just developed markets. To that end, it is very interesting to compare the underlying fundamentals of the Indian and Chinese markets. 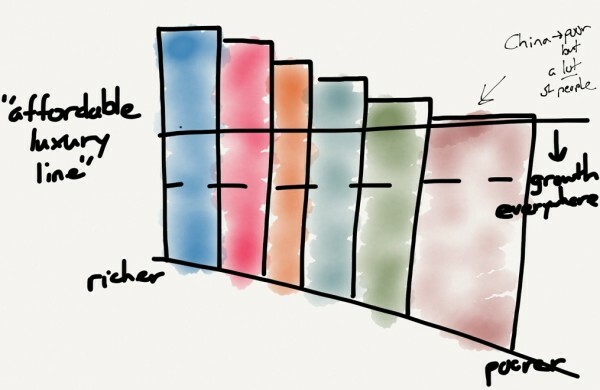 Why is it that Apple is doing so well in the latter, while barely penetrating the former? 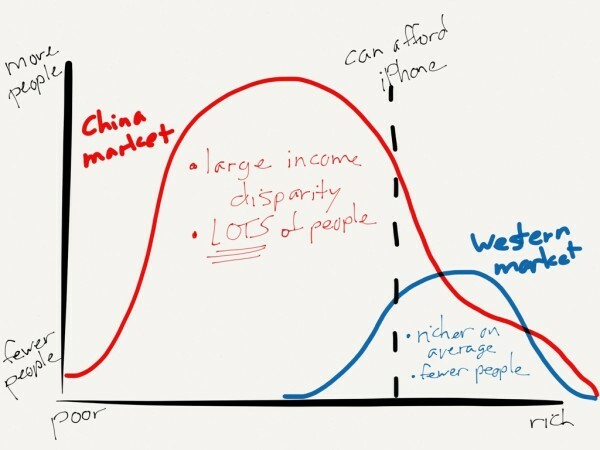 So while many Western markets may have a greater percentage of the population that can afford an iPhone, the absolute number of Chinese who are potential customers is very high as well. The nominal GDP per capita in China is only $6,747 – clearly not enough to afford an iPhone! Ultimately, I think these numbers confirm my hypothesis: Apple is indeed the preferred vendor for people at the top of the market, but because the iPhone is priced (about) the same everywhere in the world, its market share is a function of a country’s average income and the way in which that income is distributed. 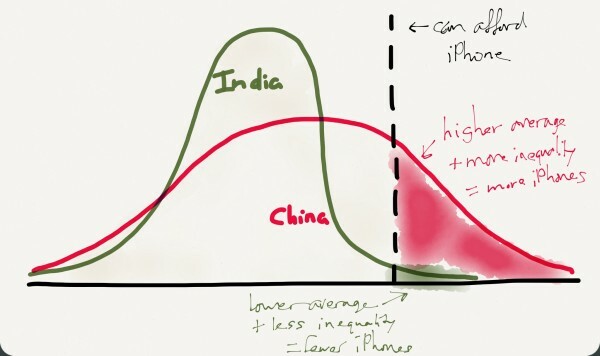 To be fair, this is hardly a controversial thesis: the more pertinent takeaway is that as long as Apple has globally available iPhones (which I don’t think will ever change), the chief constraint on Apple going downmarket in countries like India is the risk of forgoing profits in countries like China or in the West, both of which have plenty of people who can afford Apple’s prices. That’s why I continue to doubt we’ll see Apple abandon its lower-cost iPhone = old iPhone strategy in favor of releasing a new-to-the-world low cost device. Buying Smartphones in the U.S.
Next post: Is BuzzFeed a Tech Company?